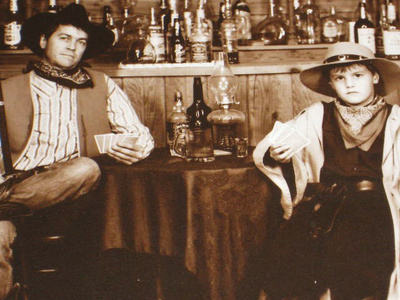 This is a picture of my son and me at Branson, Missouri, playing “cowboys”. Talk about some real desperadoes. There were times when I have been desperate. I had no shelter, no home, no car, no food, no job, no money and no friends. I was so far down, I could only look up. All I had to offer were two empty hands. I had exhausted all options. I was desperate and in my desperation, I cried out to God. This is exactly when I came to know Him. Actually, he had sought me, then caught me, then bought me, and finally taught me…what I ought be: A child of the King. We are all pilgrims, on a journey, through trials and tribulations and I discovered that what you tolerate, you will never change. And God uses circumstances to call us to Himself in about 10 to 15% of the times. The remaining times that we come to know Christ are through other Christians. When you hit bottom, there is no place to go but up. They leave us thinking, “What will I do now?”, and “What are my options?”. When we are self-sufficient, God can not use us. When we are rich and have all our needs met, we have no need for God. This happened time and again to ancient Israel. But, when we become desperate and only a miracle can help us, we turn to God. When we come to the end of our rope and to the end of ourselves, there was God…waiting all the time. Waiting for us to come with nothing to offer but open, empty hands. God actually desires us to be in desperate need of Him. To have a total dependence upon Him is to be completely in His will. Ironically, we have victory when we totally surrender. I am a father and grandfather…and I must admit, I was joyful when my children came to me for help or advice. They knew that I would help them and give them the advice or things that they needed. What they needed and what they wanted were not always the same thing. This is much the same as God the Father desires. He wants us to be earnestly depending on Him for all things. A 100% dependence upon God is a person that has bowed the heart and humbled themselves. God resists the proud, but gives grace to the humble (James 4:6). Just like my children, when they were in trouble, and the more desperate they were, the more my attention was completely undivided. God hears and answers us in our time of need…but He will not listen or answer those who are going on in life in their own strength. It is in times when our backs are against the wall and we cry out in desperation that He hears and answers us. When our own strength fails us, remember that He is faithful to bring us into His strong and loving arms (Luke 15, 1 John 1). Ironically, when we are weak, we are strong. As it says in 2 Corinthians 12:10: “For the sake of Christ, then, I am content with weaknesses, insults, hardships, persecutions, and calamities. For when I am weak, then I am strong.” He desires us all to be desperadoes…desperate for Him, who is our present help in times of trouble (Psalm 46:1). In that sense, we are really all desperadoes.